Our bestselling facial cream, with black caviar, white truffle and almond seed extract. An ultra-luxe corrective formula specifically developed to gently restore and correct post-chemotherapy hyperpigmentation, it works equally well for age and hormone-related discolorations such as age spots and freckles. If your skin is roughened or darkened with age and sun, or suffers from the damage caused by powerful chemotherapy or other medications, this is a lifesaver! The black caviar and white truffle help balance and nourish skin for an even, youthful glow with a restored elasticity and a dewy texture. Even tone is restored with a combination of skin brightening agents. Turn the clock back with this deliciously effective, decadently rich cream. Deliciously addictive! To use: Apply daily after cleansing and toning. Allow the cream to absorb into skin for a full minute before applying any other product. Aloe Vera Concentrate, Aqua, Prunus Dulcis (sweet almond oil), Persea Gratissima (Avavado Oil) Steric Acid, Cetearyl Alcohol, Decyl Gluoside, Caprlyl Glycol, Phenoxyethanol, Glyceryl, SepiWhite MSH, Arbutin, DEA PG-Propyl, Peg/PPg -18/21, Dimethicone, Sodium Metabisuffle, Morus Bombycis (Mulberry) leaf Extract, Tuber Magnatum (White-Truffle) Extract. Black Caviar Extract, Fragrance, Triethanolamine, Carbomer, White Flower Extract, Mandelic Acid, Daucus Carota Stiva (carrot seed) Oil, Glycyrrhiza Uralenis (Licorice) Root Extract, Allantoin, Tocopherol, Retinyl Palmitate, Sepiwhite MSH, (Fragrance), Triethanolamine, Carbomer, White Flower Extract. 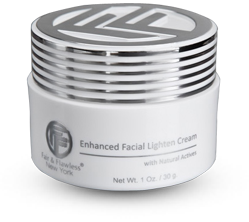 In 2015 Was advised to buy Enhanced Facial Lighten cream. It worked so perfectly there was a tremendous change my skin was flawless. I have been using various Fair and Flaws products, just to experiment and to see the effects. 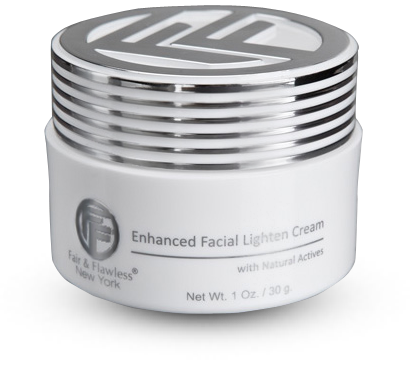 In comparison to Fair and Flawless - Esthetic Blend Face Whitening Moisturizer, which made a visual difference, this skin product lighten my skin significantly. I like my skin color right now, but I am going to try another product the gel, and see which one of the three works best for my skin. But yes, my face lightened to match my chest area which is the lightest part of my skin, because it is never exposed to the sun. Great product! LOVE to try!! As I am getting older (45) I really want to keep my Face Healthy & out of the sun. I see some dark spots & really do not want that to happen..I have Fair Skin & those age spots are showing slowly. Excellent product! I used F&F for 2 years before trying this cream. Highly reccommended!